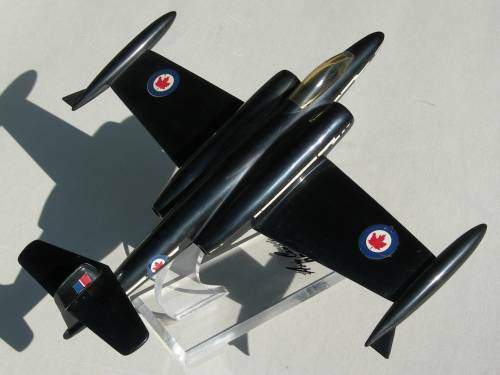 I attempted to model a CF-100 Air plane. 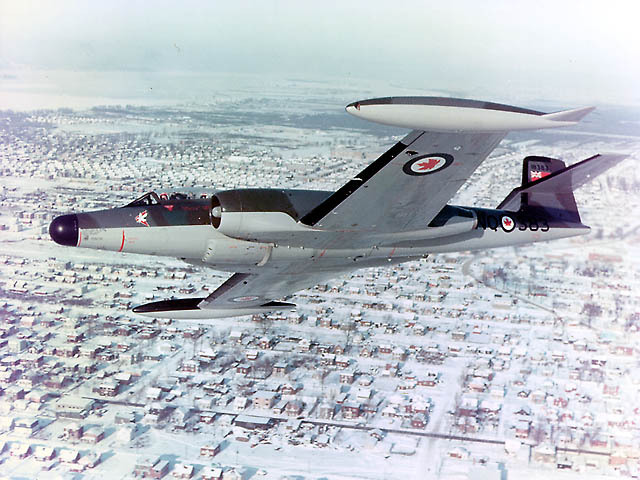 You can see these or the more common T-33 outside several Royal Canadian Legions in Alberta and its where I got the idea. I got the specifications of the plane off the Nanton Air Museum. I used an older version of 3d Studio Max 8 to do the modeling. I used an existing P-33 bomber tutorial on the 3d Studio Max web site to help me model the airplane. The planes may be different, but the general modeling concept was the same. Essentially it boiled down to getting a top-down, a left, and a front view point picture to scale and model to. I used this image to get the dimensions and model to. I broke the plane up into 4 different parts and modeled them separately. The wings were the easiest part to model. I just made a rectangle over the top down perspective and matched the vertices to the picture and then modeled a slight air frame. I used the taper and the bend modifiers to give it a slightly better shape. Next I modeled the turbines. These were the most difficult for the modeling, because they were harder to shape and contained internal structures. Such as another cylinder and a tube for the propeller shaft. This took a bit longer. The main body was more difficult than the wings. Namely because I couldn't get the cut feature to work properly. Thus my cockpit didn't turn out exactly how I wanted it to. Also I had to do without the symmetry function because it made my mesh look ridiculous. I used the same pictures to model the main body and attempted to create a cockpit using the cut function. This is where I ran into the most trouble with 3D studio Max. I could not get the UVW sections to work correctly or follow the tutorials and come out with a reasonably decent texture map. I'm not sure if this is a problem of my lack of artistic skill or just ineptitude with the program. Please note that I can barely draw reasonable stick figures so this plane was a fairly decent leap for me. I made use of the material editor and attempted to create a reasonable material and use a dark black plastic like material to texture my plane. I was going for something close to this color. . This is a picture of the finished project. As you can see the cockpit is built right into the model. When I attempted to use the cut function and the chamfer to bring that part out more, so it was more pronounced, the program hung. I'm not sure why, but after about an hour of attempting to fix it I gave up and settled for this. For my final set I modeled it over a reflective plane. The reflective material I made through a tutorial, the yellow metal was edited from the metals given in the material library. The black plastic look was also created from a tutorial found with google, and the Canadian flags were stolen off the Canada web site. For a first effort in 3D studio max I feel that this is alright. It does resemble a plane albeit a more toy like fashion one than I wanted. I enjoyed the modeling, but found the texturing to be somewhat irritating. 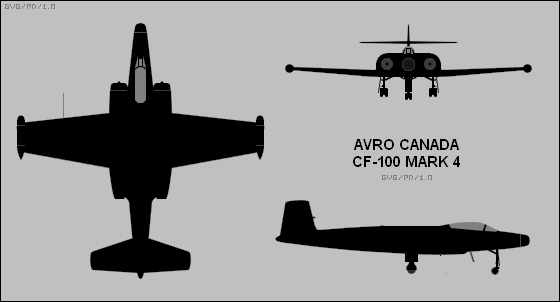 I didn't ever actually get the UVW map system to work so I just made planes and applied the textures for the Canadian maps onto them and placed them on the wings. I fitted them pretty closely, but in the first picture you can see one lifting. All in all this was a pretty fun project and I look forward to attempting to model some other things in 3D studio Max in the future.